To explore the boundaries of the artistic experience. TAE promotes and supports experimental artistic production and research, and seeks to explore the boundaries of the artistic experience and its integration into daily life within different socio-cultural contexts. TAE organices and promotes seminars, cultural retreats, academic exchanges and dialogues within Site-specific art. 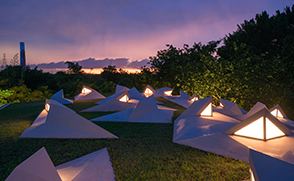 It also curates and manages Site-specific works of art in the Yucatan, Mexico. 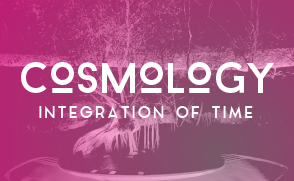 In Turrell’s own words, Árbol de Luz “is a place where people can gather, with intention, to share out of the ordinary experiences as well as celebrate de uniqueness of the space itself. That´s what we´re doing in Ochil; celebrating the connection with the waters below”. 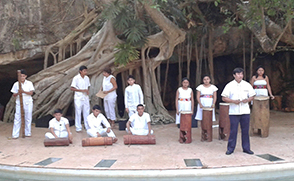 The cenote is set in the heart of San Pedro Ochil, an 18th century hacienda, serving originally as an active producer of henequen (sisal) in the Peninsula of Yucatan, Mexico. 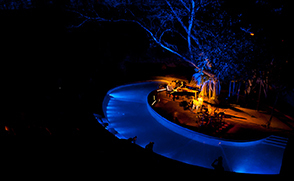 Today Árbol de Luz, hosts cultural events, and it is open for vistors to come live the Turrell experience every Friday. 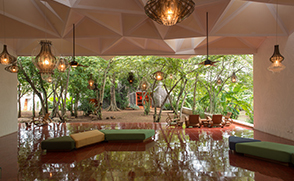 - This past December, James Turrell honored us with a visit to his latest work of art in the Yucatán: Árbol de Luz, in the Cenote at Hacienda Ochil. His evening visit was a true gift, as those of us present, watched him reprogram and create a new symphony of lights to reflect upon the mysterious cenote and the amphitheater that houses it. Flowing colors now dance off different spaces, combining with the beautiful sounding magic coming from the nearby jungle. 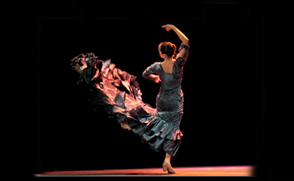 -Several groups of art lovers and experts have visited and enjoyed Arbol de Luz this year. TAE was honored to have received a visit from the World Monuments Fund from New York City and The Art Center from Pasadena, Ca. Tecoh was born as a live work of art in 2011, after five intense and exhausting years of work and dialogue with the Cuban-American artist Jorge Pardo. 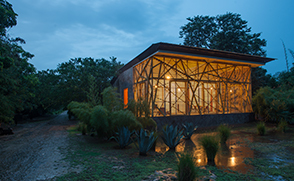 It was the ruins of a 17th century Hacienda in the Yucatán, México, which presented the ideal architectural and landscape conditions to create a Site-specific work of art. .
Today Tecoh, hosts workshops, experimental co- creative processes, aesthetic retreats and transforming dialogues. -The acclaimed artist Laurie Anderson will be in concert at Arbol de Luz, Ochil for a benefit gala in aid of Mayan community projects. She will also be visiting Tecoh. - Tecoh had the honor of welcoming the Social Presencing Theater Master, Arawana Hayashi, this past March. Growth and self-transformation were the objectives of this workshop, which created a magical ambiance amongst the participants in the workshop. - Several groups of art lovers and experts have visited and enjoyed Tecoh this year, such as the World Monuments Fund from New York City and The Art Center from Pasadena, Ca.. Their interaction and energetic conversations have enriched and contributed to Tecoh’s multidisciplinary co-creative thinking platform. -Tecoh at Tate Modern, London. October, 2013- Tecoh was the departure point for the Symposium entitled ”Transforming Places: Site and Locality in Contemporary Art”. Its objective was to explore, through the lens of contemporary art, the complexities of commissioning and producing Site-specific Art, while also considering the dimensions of place, locality, culture and ecology. See more.